The EU's chief Brexit negotiator has urged the UK to begin talks "very quickly". 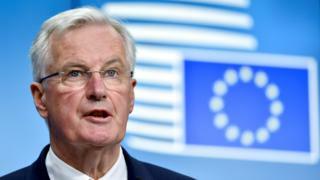 Michel Barnier warned that no progress had been made on the "extraordinarily complex" talks since Theresa May invoked Article 50 in March. "I can't negotiate with myself," he told the Financial Times. Formal talks were due to begin on 19 June but the UK government has been left without a majority after Thursday's general election. No date was set for the start of negotiations at the first meeting of British and EU officials in Brussels. A diplomatic source said the meeting consisted of preparatory discussions ahead of the main talks and that further contacts would continue this week. Downing Street has insisted that Thursday's general election - which Theresa May had hoped would strengthen her mandate for negotiations but ended up creating a hung Parliament - will not change the approach to Brexit it set out last year. "Next week, it will be three months after the sending of the Article 50 letter," Mr Barnier told the Financial Times and other European newspapers. "We haven't negotiated, we haven't progressed. "Thus we must begin this negotiation. We are ready as soon as the UK itself is ready." Even senior Tories like the leader of the Scottish Conservatives, one of their few success stories at the moment, told us yesterday "it can't just be a Tory Brexit". On first hearing that is a staggering thing to hear from Tory lips. Mr Barnier added: "Time is passing. It is passing quicker than anyone believes because the subjects we have to deal with are extraordinarily complex. "It will take months to draw out the conditions of an orderly withdrawal. Mr Barnier, a former minister in the French government, said Britons had the right to know the "consequences" of leaving the EU. "Lots of people underestimated these consequences," he said. On Twitter, the European Parliament's lead negotiator, Guy Verhofstadt, said: "We are impatiently waiting for the negotiating position of the UK gov. "The current uncertainty cannot continue." Mrs May called the general election claiming rival parties were trying to sabotage her Brexit plans and promised to be a "bloody difficult woman" during talks. Since the result, which leaves the Conservatives relying on votes from the Democratic Unionist Party to stay in power, there have been calls for a more cross-party approach. Former Tory leader William Hague is among those suggesting the setting up of a cross-party commission to seek agreement, and Scottish Conservative leader Ruth Davidson has said the economy must be at the forefront of the UK's demands.